Using a range of equipment, cultivation encompasses a broad range of services in ground preparation. Cultivation is often classified into two types, primary and secondary. Primary cultivations tend to produce a rough surface finish, whereas secondary cultivations produce a seed bed with a smoother surface finish ready for drilling. 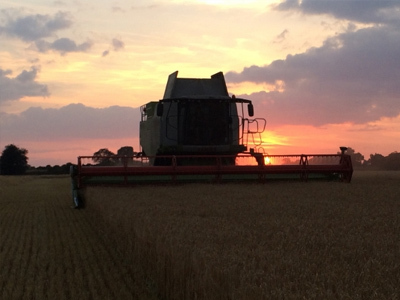 As part of our contract farming service, we undertake full cultivation and seed bed preparation ready for drilling. We offer a full range of cultivation techniques suitable for all soil types and depending on the crop you wish to plant, we can advise and employ the best technique to ensure the ideal seed bed for a successful crop. By using the right type of the cultivator to suit the conditions at the time, you will get the most consistent establishment for your crop which will reduce your establishment costs and increase your overall profitability. Ploughing is a process used to help prepare the soil for drilling by loosening and turning the soil. Typically, this primary form of cultivation takes place in the autumn or early spring and serves to turn the upper layer of soil bringing fresh nutrients to the surface whilst burying the surface debris and loosening the soil. As the plough is drawn through the soil, it leaves in its wake long furrows of fertile soil. It is normal practice to leave the soil to dry out ready for secondary cultivations such as harrowing to prepare a more level seedbed for drilling. Subsoiling can help to improve the growth in all crops where compaction is a problem. Inevitably, soils become compacted in areas tracked by machinery which can restrict the movement of water, air and plant roots within the soil; impacting on their survival. Subsoiling breaks up the soil layers below the normal tillage depths alleviating structural compaction in the rooting zone which can lead to better drainage, better root development and increased fungal and bacterial activity. High clay content soils in particular can really benefit from regular subsoiling to help with drainage and aeration as well as encouraging worm populations and the general improvement of the soil structure. The result is a soil environment that is ideal for maximum growth, leading to stronger crops that are better suited to withstand long periods of prolonged rainfall as well as drought. Mole draining, done correctly, can help to reduce the risk of waterlogging by guiding excess water to land drains in heavier soils and can also improve drainage where there are not conventional land drains. 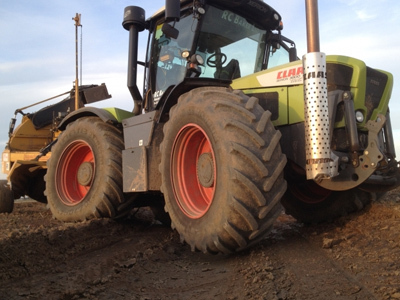 Operated with a CLAAS XERION, the mole drainer creates unlined channels with a ripper blade with a cylindrical foot and expander which helps compact the channel wall. Typically, clay soils are best for this type of drainage as the clay helps to hold the unlined channels together and reduces the risk of the compact channel walls collapsing. Sandier soils tend not to hold the mole drains as well. A good mole drain in the correct conditions can be the most cost effective way of draining. 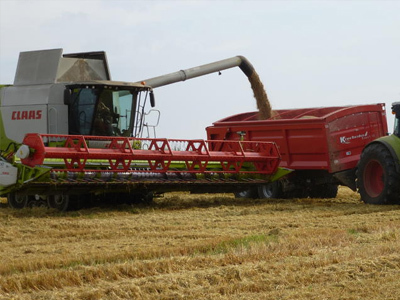 Discing is a primary cultivation often carried out behind the combine to aid germination of grass, weeds etc. followed by a spray of roundup and then a second pass to leave a seedbed. Power harrowing is generally used for secondary tillage after ploughing and subsoiling and can break up the most compacted ground, often in a single pass. The main purpose of power harrowing is to break up the clods and provide a finer finish with a good tilth which is suitable for a seedbed. Power harrowing doesn’t invert the soil layers which is useful in preventing dormant weed seeds from being brought to the surface as well as maintaining the soils natural composition, structure and biodiversity. 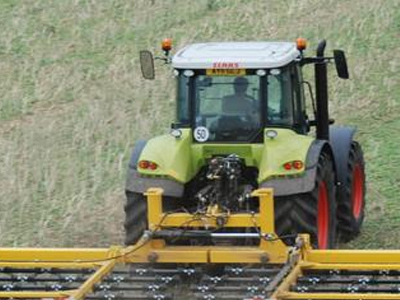 Straw harrowing provides a quick and cost effective means of encouraging chitting for more effective herbicide control. It is the best way to encourage weed germination and guarantees a more successful strike rate when re-harrowing or spraying before seeding. The harrow causes very little soil disturbance and rakes away any remaining straw along the ground after harvest, breaking down the crop residue and distributing it evenly. By moving the straw, the harrow helps to expose slugs and eggs to the sun which also helps reduce their numbers. Rolling helps the establishment and growth of crops in the early stages of their growth. Rolling is critical after drilling to ensure the consolidation of the soil around the young seed which helps make moisture and nutrients available to the young plant. Rolling can also be carried out after the crop is well established. This may seem detrimental to the growth of the emerging plants but the benefits outweigh the slight set back in crop growth and not only will the rolling consolidate the soil but it also helps to reduce slug activity. If you are interested in Cultivation why not give us a call on 01869 338307 or send us an enquiry.